Lionel Messi at the 2018 World Cup. 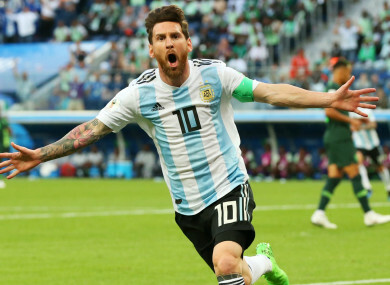 Messi has not played for his country since the 2018 World Cup, where Jorge Sampaoli’s side lost to eventual winners France in the last 16. Sampaoli’s successor Lionel Scaloni has been unable to call upon the Barcelona captain for any of Argentina’s matches since taking charge. Inter striker Mauro Icardi also misses out, as he has not played for his club since 9 February amid a stand-off that began with him being stripped of the captaincy. Gonzalo Higuain is another high-profile attacking omission. Like Aguero, Chelsea’s on-loan Juventus striker has not been involved for the Albiceleste since Russia 2018. Email “Messi ends international exile to return to Argentina squad ”. Feedback on “Messi ends international exile to return to Argentina squad ”.